Mother’s Day is around the corner! I’m sure you’re aware of it and I’m sure you’ve already begun fantasizing about what you would like to be given. When I checked in with you on Instagram it seemed most moms just wanted some time to themselves. A day without worrying about is the house clean or the dishes done. A day to be treated like the queen we all know you are. You deserve that and so much more!!! Figured I would share some ideas for tangible goodies you might be interested in just in case your family can’t survive with giving you a day off! I got you covered almost head to toe! How many times have you bought a pair of shoes and not been able to wear them because they looks crazy with socks and are too uncomfortable without? Or maybe it’s too cold outside to just slip on your shoes? Keysocks are what we’ve all been needing. These are fun, comfy and are virtually unseen in most flats. And if you can see them in your shoe then it’s only a sliver. The way the weather in NYC has been I’ll probably needing mine for a while longer. Remember how in my Spring Fashion Plan I mentioned that every once in a while we deserved to treat ourselves to a good pair of jeans? Well, when I attended the Well Rounded Tips By Trimester event I was introduced to my new favorite splurge jeans. I now own a pair and more pairs are on my eternal wish list. These jeans as so COMFY. You will feel like you’re wearing sweats. They also hug your body in a way that accentuates the good and shadows the not so good. Oh and for those that are size conscious they make you feel good about yourself their too by dropping you about two pants sizes! Here I am at a recent event wearing my NYDJ, my Armigami and my Armitron watch! When I learned about this at Momtrends’ Holiday Soiree I was in awe. There are at least 18 ways to wear your Armigami. Yup, you read that right and I’m going to go as far as saying there are 19 because I wore mine as a headscarf the other day! You no longer have to feel like you have nothing to wear because this can be a shirt, skirt or accessory! I’ve never been a watch person. I’ve always more been into bracelets. Yet, when I walked into a Mom’s Time out event showcasing Armitron watches recently I was oohing and ahing all over the place. This photo is of my new beauty that JustaBXgirl has already tried to claim on more than one occasion. Looking for a good book to read poolside? Stacey Lender’s debut novel is just the book for a summer read. It’s humorous and light hearted while at the same time addressing issues many of us might be able to relate to even in not in the same exact way they play out in the novel. Do you live in a city? Do you often dream of having a backyard? Think about how simpler life will be if you moved to the suburbs? Or maybe you can’t imagine leaving the hustle and bustle of city life. What will you do without Chinese Food and Pizza being a short delivery away? How do you fit in with the moms that seem to have it all together when you feel like you’re falling apart? What really goes on inside that perfect home with the perfect manicured lawn? Are you ready to find out? Go ahead, get your copy on pre-order now! Expecting Sunshine written by Alexis Marie Chute was powerful. If anyone has ever lost someone they loved I think this is a good book for them to read. Alexis Marie and her husband lost their second child, their first son as soon as he was born. This book is the story of how she grieves and begins living again. It is the story of her bravery to continue being a mom to their daughter and her courage to have another child after losing Zachary. The poem in the above picture is on the first page and sets the tone in an amazing way for the book. I cried while reading this on more than one occasion but more in a cathartic way than a sad one. We don’t always realize how much of grief we hold onto as we struggle to find a new normal after losing someone close. For all of the mother’s that have lost their child my heart goes out to you. I pray that you have the strength to get up everyday. I pray that your family and friends support you while giving you space to grieve. And I pray that you get to talk about your lost child daily because it seems in all I read and feel about grief speaking of the person lost is so much less painful than having their names left in the silence. If you’ve been following me for a while you know that I LOVE Usborne books. I was a consultant for Usborne for about two years and still am a customer. I’m a fan of their sticker books and coloring books for adults. If you have a fashionista for a mom or are a fashionista yourself you will love this and many others they have available. You’ll also be supporting a small business. Speaking of adult coloring books this one is gorgeous! And the perfect gift for a mom. Each page has a message or bible verse that speaks to a mother’s heart. I know just looking through the pages brings a smile to my face and taking time to color brings a calm to my soul. Think of how nice a time you can have spending some time coloring with your mother on Mother’s Day. Once upon a time I held a standing appointment for a weekly manicure and pedicure. That’s not my reality any longer. Now I’m more of a at home pedi girl with a myriad of colors and normally rainbow matching toes with JustaBXgirl. That being said a device like the Toilettree Electric Callus Remover is a great addition to those at home pedicures. Even without my weekly pedicures I’m blessed with pretty cute feet that don’t need much extra care. It is however getting into sandal season and I’m a firm believer in wearing open toed shoes until it starts snowing again. That being said having something like this to help soften the edges is a true help. Make sure you use it over a small trash can though because there is no place to catch the dry skin. Some brands you choose without even realizing it. Softsoap is one of those brands for me. I’ve been using it for so long I couldn’t even say when the relationship began. 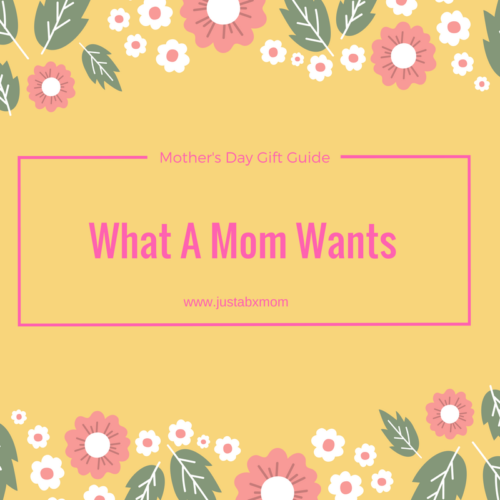 I was really excited about including these in this guide because let’s be real, most of us won’t be getting to the spa for Mother’s Day. These limited edition scents from Softsoap (Eternal Bloom and Blushing Bouquet) will make you feel like your home shower is a mini spa. Blushing Bouquet makes me think of a vacation. At least until I hear my giggling four year old standing on the other side of the shower curtain. The Eternal Bloom reminds me of summer weddings. It reminds me of admiring beautiful flowers while being kissed by the sun. There you have it. My list has something for everyone in every price range. And of course make sure to enjoy every hug, every kiss, every smile that you’re littles bestow upon you because we are the blessed. We are the ones that get to spend the day with our babies. We are the ones that get to create elaborate wish lists and get frustrated when we don’t receive our gifts the way we planned them. On Mother’s day please take a moment to pray for the mothers who no longer have their littles to hold onto. Please take a moment to pray for those who have lost their mothers and to those who have never known their mothers. And please, please, please take a moment to take a photo to remember on that day just how loved you really are.